You might not be able to teach an old dog new tricks but it seems you can teach a cat, if you give it enough treats that is. Tasty snacks are definitely the way to this kitty's heart as can be seen from her willingness to perform stunts in return for a bite to eat. The adorable Scottish Fold cat sits obediently as its owner holds up a firm hand close to its face. Directions are given to her in the way of gestures, as well as voice commands in both English and Japanese. This feline is more than just a pretty face. 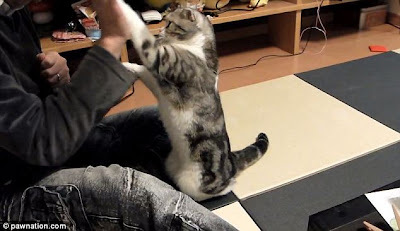 She responds to the hand signal by rearing up onto her hind legs and begins to play 'pat-a-cake' with the man sitting before her. She high-fives him first with one paw, then two, before prying a treat from the man's hand and chowing down. Next the acrobatic kitty spring leaps gracefully across the man's outstretched leg. Showing off how well behaved she is the cat sits patiently back down to await the next food offering, but can't resist sniffing at the man's hand when he puts it out to ask for her paw. Disappointingly realising it is empty she performs the requested stunt, lifting first her front-left then front-right into the palm of his hand. But the temptation proves too hard to resist and she clambers up, eagerly seeking out the next offering. 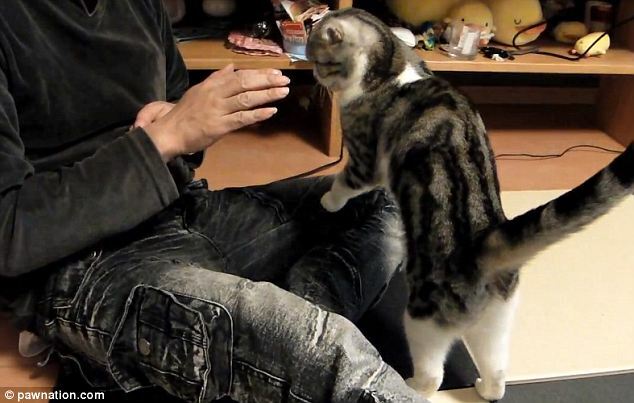 At first the playful kitty is willing to perform several tricks before being rewarded with a treat but she soon grows wise to her owner's rationing and demands one treat per trick. The owner tries in vain to get her to jump several times in a row back and forth across his leg before caving and producing a treat. 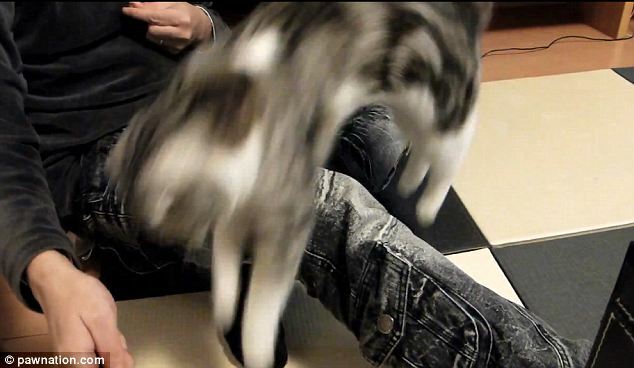 The clever cat immediately reacts with a well-rehearsed leap. You can tell who's boss in this household and it seems she has quite a following. This YouTube video has had 76,839 hits and is just one of 38 clips showcasing her skills. The starlet kitty even has a blog dedicated to her, written in Japanese, and with a series of heart-melting photographs documenting her activities.